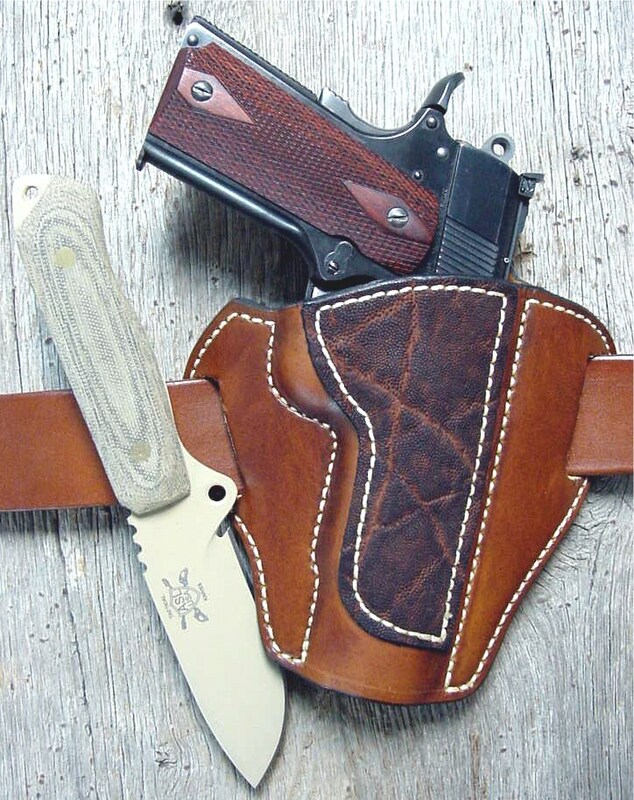 Note: The application of exotic leather accents or making the entire holster out of a special hide requires an intricate, specialized and expensive production and tanning process which makes the final product more costly, but much more durable and beautiful. 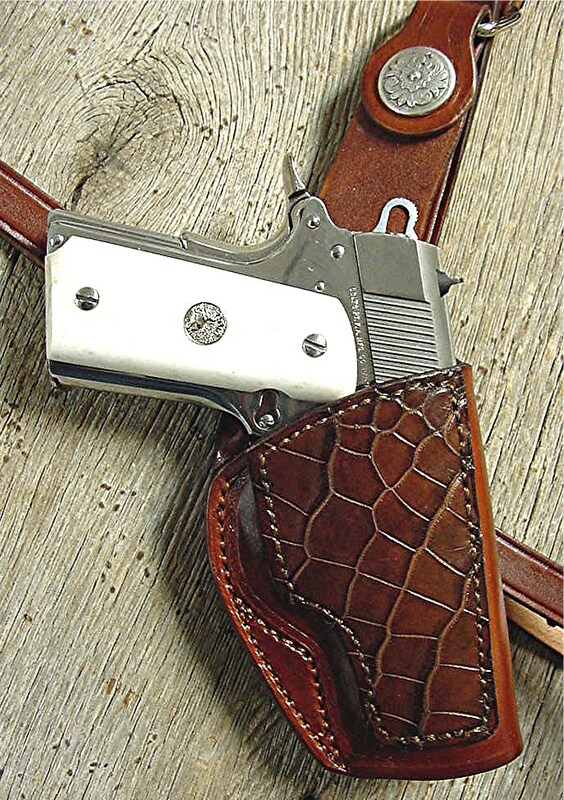 Each holster, belt, mag pouch or other item virtually ends up a “one of a kind” since each piece of exotic leather is different in pattern, texture and color. Our elephant hide is specially processed for use in cowboy boots and, as a result, is tougher and more durable than normal leather. (photo pending) Many customers, Law Enforcement, professionals and others, are required to remove and put on their holsters and mag pouches many times a day due to various restrictions and tasks. Therefore we are now producing the “Snap On” belt holster for them. The belt loops can go over or under the belt depending on the pattern without taking off the belt. 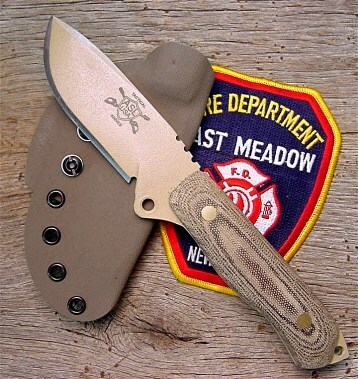 Most operators feel that the style that ends up with the flaps up is the most secure. If a flap comes undone for some reason at least it is sitting on top of the belt and will not fall through. We have been approached to make several of these enhanced designs for the combat quality Sig Sauer LEGION P226 semi auto for another three initial Gov’t agency. With edge groove & no accent panel ~ $124.95. Accent panel adds $10. With one line of edge stamping on attached panel add $10. With special “knurled” hand tooling on attached panel add $20. With full coverage like basket weave or flowers & vines on attached panel add $25. For lining add $40. Exotic skins applied as panel add $25. Single and double clip pouches available. Patterns are ready for Colt 1911 all barrel lengths, most Glocks, Most Sigs, Beretta 92, Browning HP, and many other semi-autos and revolvers. 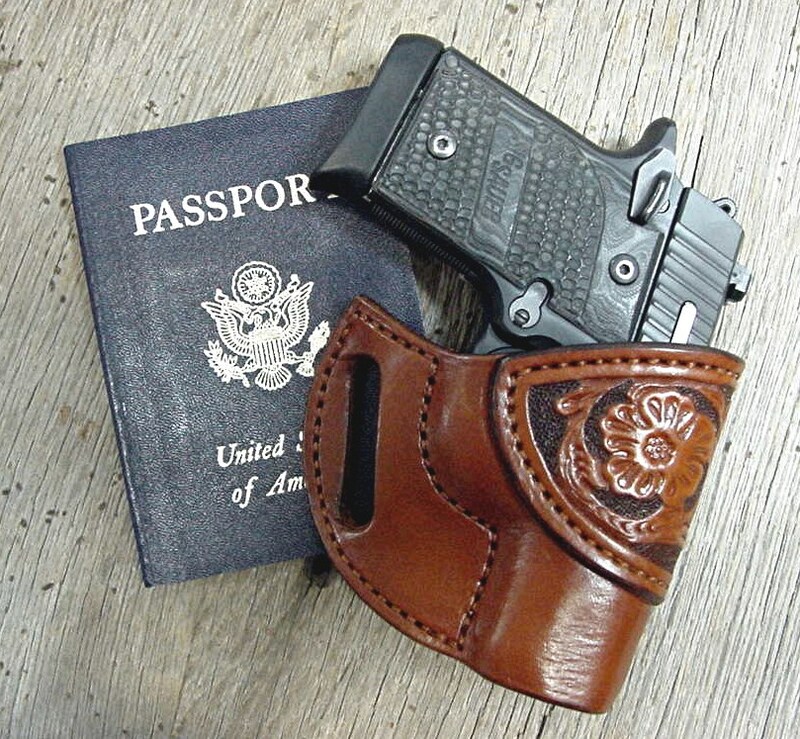 This holster is made in Gunfighter Black with grey elephant hide accents (extra cost). 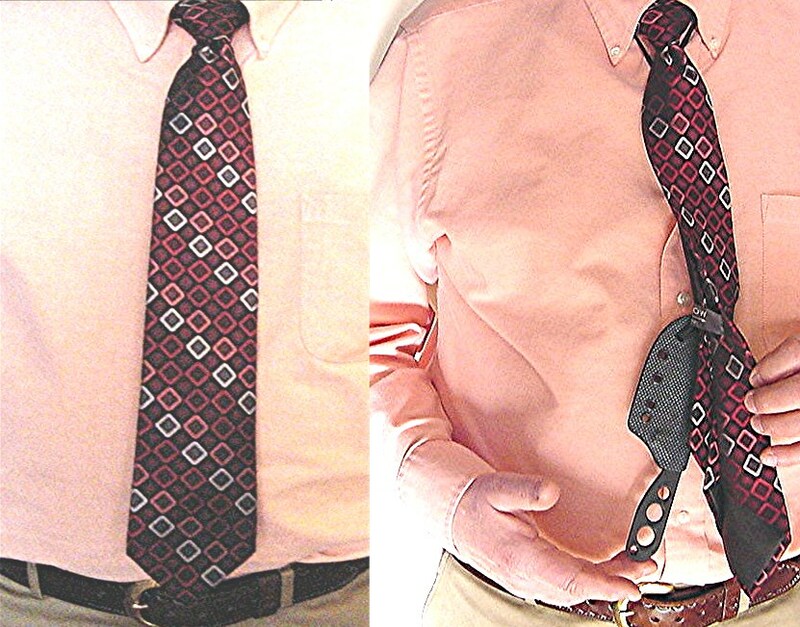 A handy blade that can be worn around your neck for a good comfortable concealable carry. The knife is 7″ long and 1 1/8″ wide. A thickness of 3/16″ makes this a real tool. Handle area has cut outs to reduce weight but a handle can easily be fitted or para cord wrap for grip. 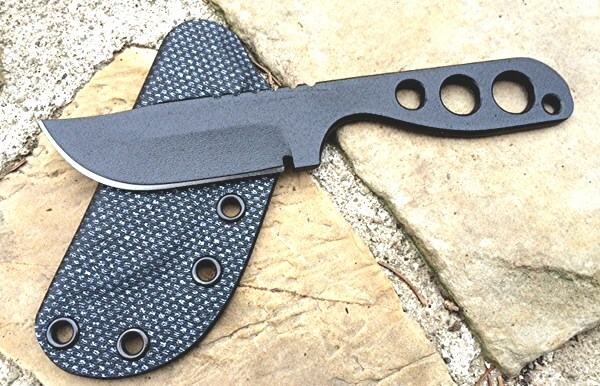 Note the use of hi tech carbon fiber for the Shadow Sheath. 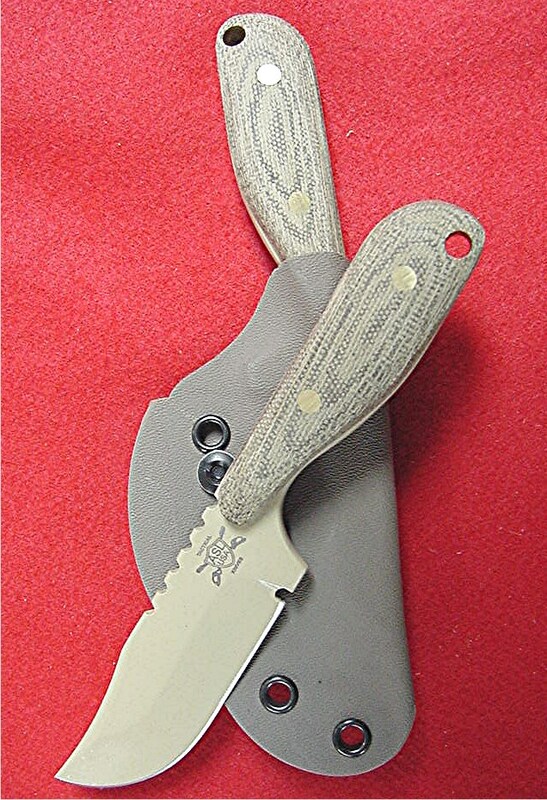 A belt clip can be ordered for wearing this sheath in over 20 different positions. The same steel and hardness as our Tactical / Survival knives below and a choice of Hummer Desert Tan, or Stealth Black ~ $79.95.